Take Inventory - Go through all of the office supplies you already have on-hand. Check out the kids closets too. See what fits and what needs to be replaced. Donate any unneeded/outgrown clothing to a charity (such as Purple Heart or The Salvation Army). Many charitable organizations can also arrange to pick up your donation right at your front door - so it really couldn't be more convenient! Keep in mind that your donation also amounts to a tax deduction (based on the fair market value of your donation) which in many instances, evens out to what you may be spending on your child's back to school needs. It's a win-win for everyone! Reuse/Repurpose: Let the kids DIY / decorate old folders/binders that are still in good shape from last year (printed/colored Duck Tape/ Glitter Glue etc. works wonders at revamping for the old, for the new school year!). Also, don't buy an entire year's wardrobe in one shot. Buy a few key pieces to get them through the first few weeks of cooler weather that can also mix/match easily with their Summer attire (a great vest, some long sleeve graphic t-shirt's, a lightweight jacket etc.). Keep in mind, the weather doesn't abruptly change just as the kids are heading back to class. They will still get plenty of wear out of their warm weather wardrobe, with the help/addition of a few key layering pieces. Check out local stores for amazing back to school supply sales, NOW. The deals tend to disappear after the first/second week of September, so make sure you have enough on hand for the entire school year, now! Staples, Walmart and Target offer amazing savings on supplies such as white school glue / glue sticks, composition books, filler paper, binders, crayons, colored pencils, markers and more! Even if you already have everything you need now, if you see a great deal on .25 cent Crayola Crayons or a great $1 deal on markers - stock up now - it will save you big $ later! Check out coupon websites such as retailmenot.com and couponsherpa.com before heading out to the store! Also, be sure to check out the store websites for printable coupons. 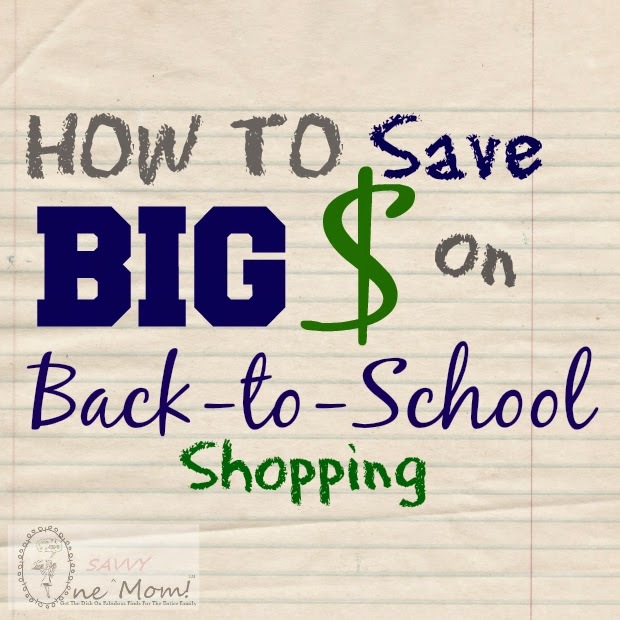 We recently shopped our local outlet mall for back to school finds and we saved HUGE by printing off coupons ahead of time. Gap Outlet had an " take an additional 40% off coupon" that applied to all sale and clearance items too! We snagged 4 pairs of Gap Kids Skinny Jeans from the clearance section for our daughter at just $4 a pair (after the added 40% savings!). We also took advatage of a deal at Adidas - we donated 3 pairs of gently worn shoes that no longer fit our kids, and they gave us $30 off of our purchase that day ($10 off for each pair donated)! Combined with the buy 1 get 1 half off sale that day - we made out great! Each of my older children picked up sneakers that were each on sale for $29.99. Normally the total would have been $59.98. The buy 1 get 1 50% off sale brought the total down $44.99; subtract our $30 off for our shoe donation made that day, and the total came to just under $15! Seriously - WOW! $15 for 2 pairs of Adidas Sneakers that normally would have set me back $60? And all for taking a few minutes to check out the deals before we left the house? Totally worth it! P.S. That Adidas "Refresh your Sole" deal is valid through August 28, 2014 - check out the details HERE . Wishing everyone a wonderful 2014 / 2015 school year!